It might be time to dip into your holiday storage a little early this year — assuming you’ve packed up by this point. If you’re anything like my family, you end up storing boxes upon boxes of candy canes along with wreaths, ornaments, and other decorations. There’s no harm in that: candy canes can last for two to three years after the printed expiration date. Let’s be real, though. Every year you buy more candy canes, ensuring that you’ll pack them away for the next year…when you’ll buy more candy canes. So let’s put them to use this year. That way next year when you buy new candy canes, you might actually use them all. Or maybe you’ll buy extra, so you can try out more of these exquisite ideas for leftover candy canes. Because once you try a few this year, you’ll want to try them all. You might even buy a few more boxes — heavily discounted, of course. 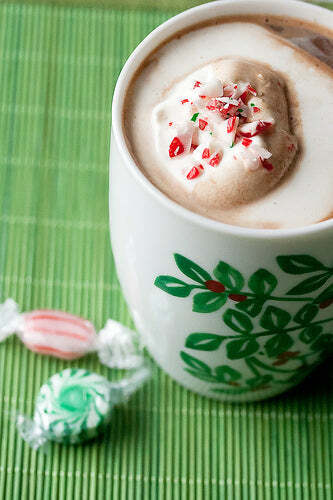 Please note: Everyone knows that you can stir your hot chocolate with a candy cane. We know you can crush them and place them on top of pretty much any baked dessert. These recipes will go at least a bit above and beyond those standards. These recipes do involve crushed candy canes, but they all add something to make the desser more than merely cookies with crushed candy canes on top. 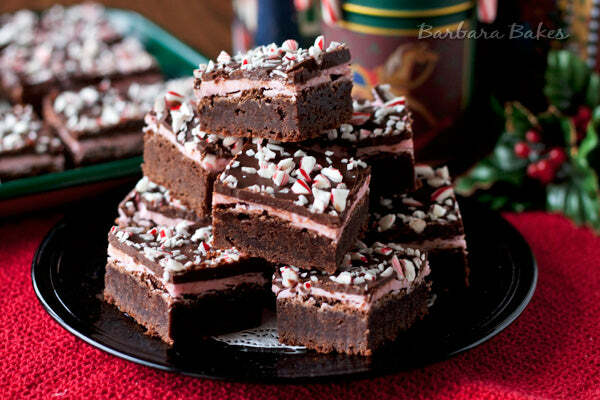 Yes, the only place you’ll find candy canes in this recipe is as a garnish atop the brownies. So what makes these stand out? Why, everything. For starters, they’re both frosted and glazed. The frosting contains peppermint extract, so there’s a theme going here. Also, among the brownies, the frosting, and the glaze there’s more than a cup and a half of butter. And who doesn’t love butter? 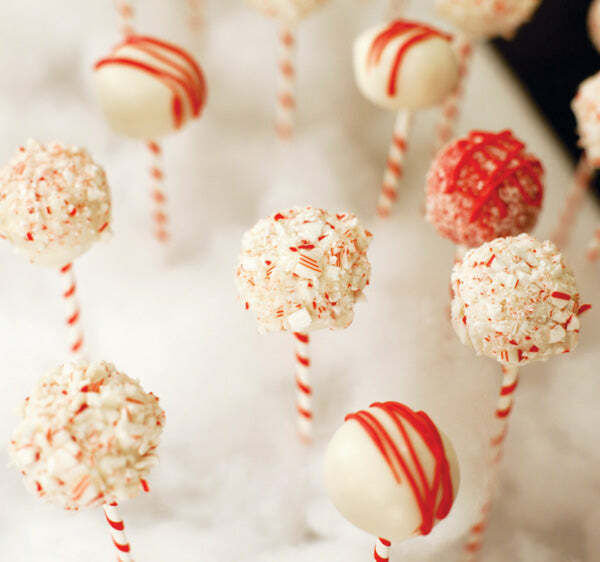 Again, we’re dealing with an overall peppermint theme here, since the cake balls contain peppermint extract. This is pretty much required to make our crushed candy cane list. Anyone can crush a candy cane. We suppose anyone could add peppermint extract to a recipe, but it’s the thought that counts. Hostess with the Mostess walks us through this relatively complicated recipe, which thankfully calls for boxed cake mix and a can of frosting. The rest of the recipe involves melting candy, which can be a huge pain for the inexperienced. But the results will be quite worth it. How could we ignore a recipe with so many delicious desserts right in the name? Indeed, Sydney at The Crepes of Wrath — for our money the best food blog name out there — includes all of these ingredients and more. The marshmallow? It’s Fluff. So yes, you have every reason to read on. There are a lot of ingredients in this, but not many steps. You basically mix everything together and bake. The candy cane crushed pieces get folded into the chocolate during the cook, so the flavors will seep throughout. 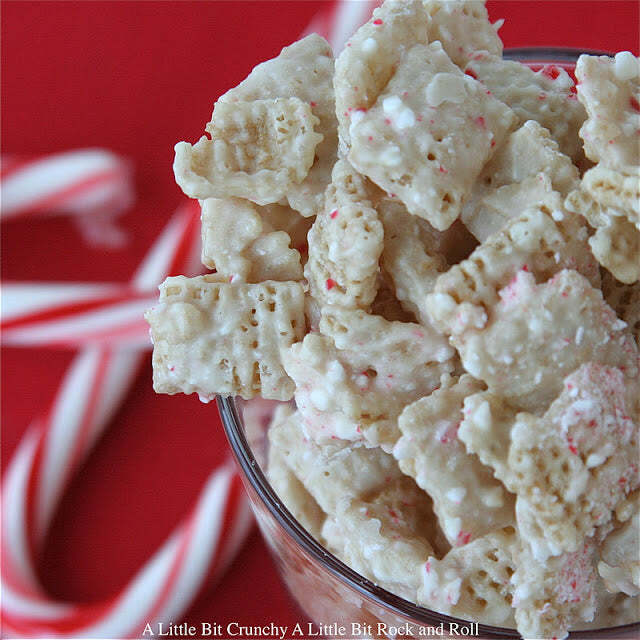 OK, OK, I admit it: this is really just a recipe rolled in crushed candy canes. You got me. But seriously, just look at that picture. I tried to eat my computer screen when I pulled this up. So you get a pass, Kathy from Playin’ With My Food. As with many of these recipes, this is kind of complicated. But if you can produce anything that looks like these, you’ll be in great shape. The candy canes do add an extra little kick, too. Plus you can pretty easily sub the crushed candy canes with other types of bulk candy for different holidays in the year. 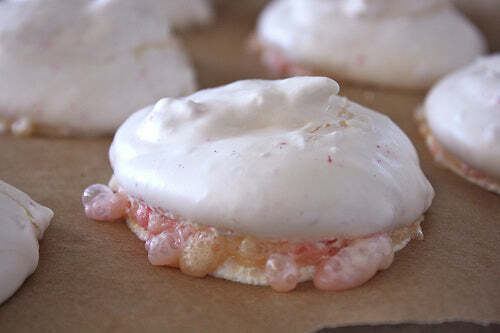 As complicated as some of these recipes have been, Heather Christo makes candy cane meringues amazingly easy. 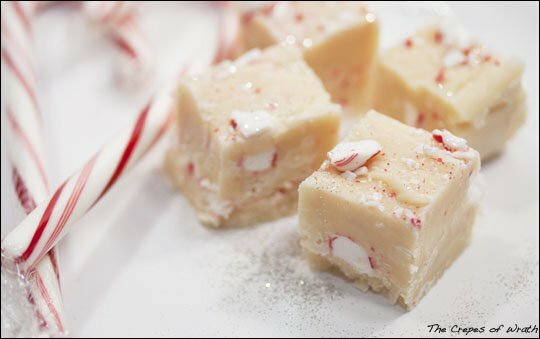 They take just four ingredients: egg whites, powdered sugar, and crushed candy canes. You probably need a stand mixer for the meringue, unless you have tireless arms that can whisk them manually. Fold in the candy canes, bake, and there you have it. If you need something simple, easy, and delicious, you might want to start with this one. Get the recipe at HeatherChristo.com. When you hear mousse, you probably think chocolate. This recipe from Raspberri Cupcakes does have chocolate in the title, though it’s white chocolate, and white chocolate isn’t really chocolate. So we’re in for a change of pace from the norm. You’re going to work for this one, but it’s going to be worth it. Melting chocolate, stirring in the egg yolks one at a time, and then stirring in the egg whites you previously separated. Including a candy cane bark recipe here was a given. Problem was, finding one that stands out was difficult. Everything seemed pretty similar. Then we ran across this recipe from the Utah Munchies blog. Combining the bark with Rice Krispy Treats puts this recipe over the top. 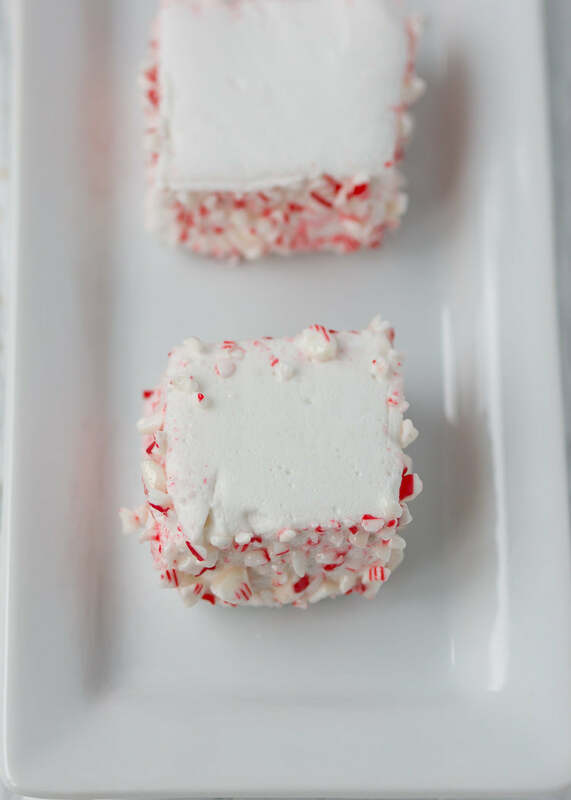 The key to this one is using peppermint-flavored marshmallows. Did you know those even existed? That gives the Rice Krispy Treats a bite, which the crushed candy canes complement. This one will get messy, what with melting marshmallows and two kinds of chocolate. But the end product looks so worth it, doesn’t it? OK, so another bark recipe stood out, though truthfully this doesn’t seem much like what we typically consider bark. It involves another cereal, Chex, which is similar but also quite different from Rice Krispies. You’ll need some almond bark for this, which might seem to defeat the point but it just doesn’t in this case. This one is pretty simple, so if you happen to have Chex and almond bark sitting around you might as well dive in right away. 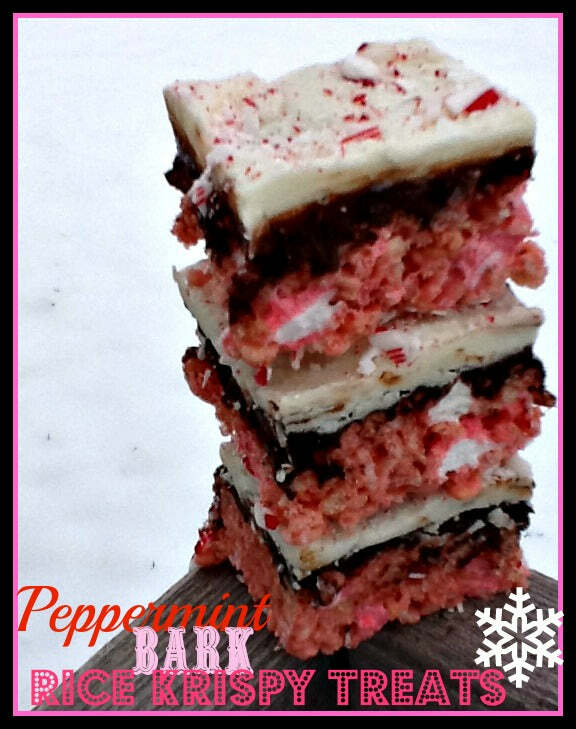 This one gets really pepperminty, too, with peppermint extract in addition to the candy canes. Get the recipe at A Little Bit Crunchy. If you want to use up your lefover candy canes by stirring them in hot chocolate, be our guests. 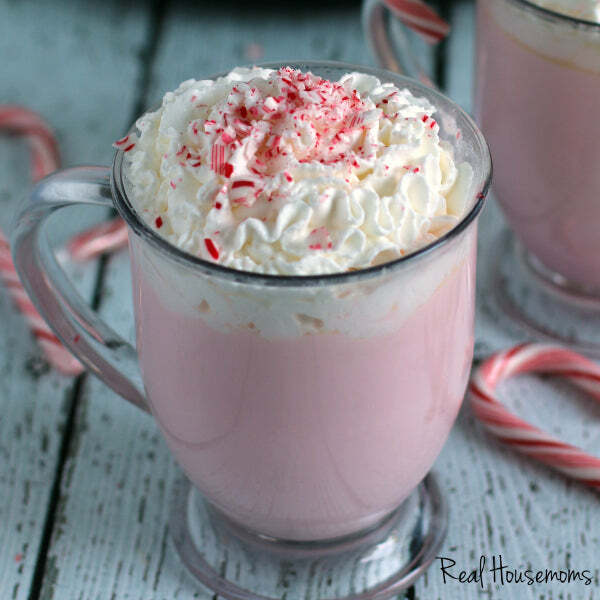 But there are plenty of other ways you can use candy canes to spice up your hot beverages. With a name like that, how could we turn away? Hot chocolate is great. White chocolate is great, even if it’s not real chocolate. The candy canes add a twist, and throwing everything in a slow cooker is an odd change of pace. So let’s dig into this one. This one involves a little TLC, as you’ll have to stir the milk, white chocolate, and candy cane combination every 15 minutes. But once it’s done, in about 90 minutes, you’ll have some creamily delicious hot chocolate with just the right amount of pepperminty goodness. Get the recipe at Real Housewives. Need a little more kick to your hot drink? You could use a candy cane to stir your coffee, but that doesn’t sound completely appetizing. But a mocha? They make that at Starbucks, and it’s delicious. So why not make your own at home? You’ll need to make a peppermint syrup, which is easy enough. The mocha itself is a bit more complicated — you’ll either have to brew espresso or settle for the powdered stuff — but all in all you can make a good four mugs of this stuff with the prep. The recipe calls for a candy cane garnish, but you can just as easily use a full one as a stirrer. 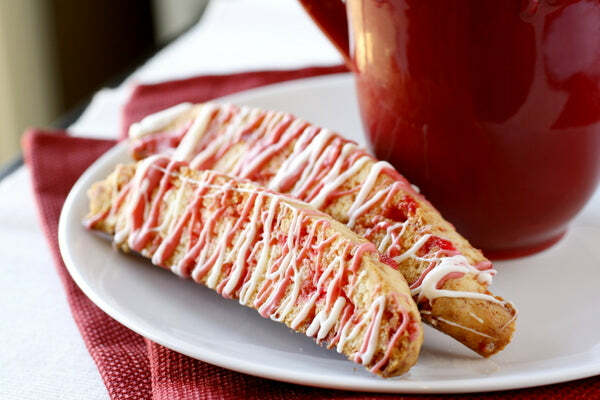 What goes better with a hot beverage than biscotti? Nothing, and we won’t hear any opposition to that opinion. Biscotti is insanely easy to make, and you can make a ton of them at once. This recipe from What Megan’s Making calls for candy canes both in the cookie itself and as a garnish. That’ll work well with the white chocolate drizzle. Now imagine dipping this into the candy cane mocha or hot chocolate. 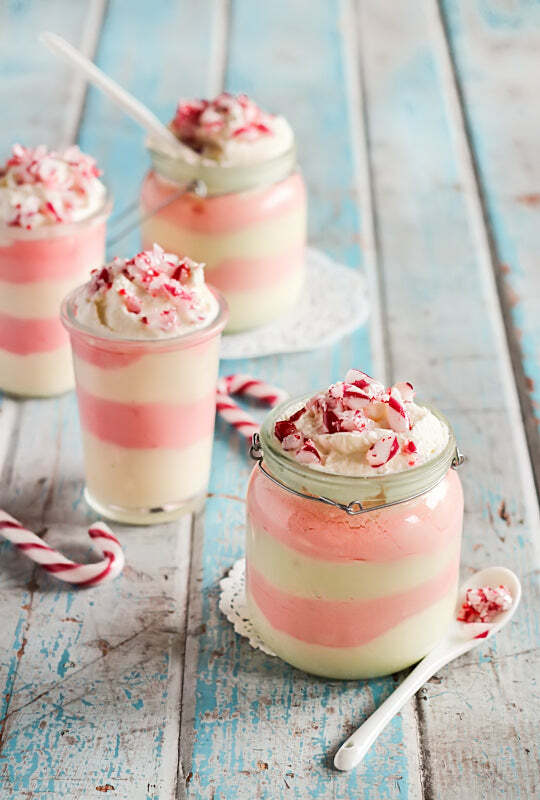 You’ll be in candy cane heaven. Get the recipe at What Megan’s Making. Sometimes you can get pretty creative with how you present recipes. These four recipes are outside the box, and let you use your candy canes in unthought-of ways. Has it ever crossed your mind to give hot chocolate as a gift? Probably not. But it’s not as far fetched as you might imagine. You wouldn’t give the finished product, of course, nor would you give simple powder. This gift, concocted by Jessica at At Then There Were 5, places all of the wonderful ingredients of candy cane cocoa in a mason jar. 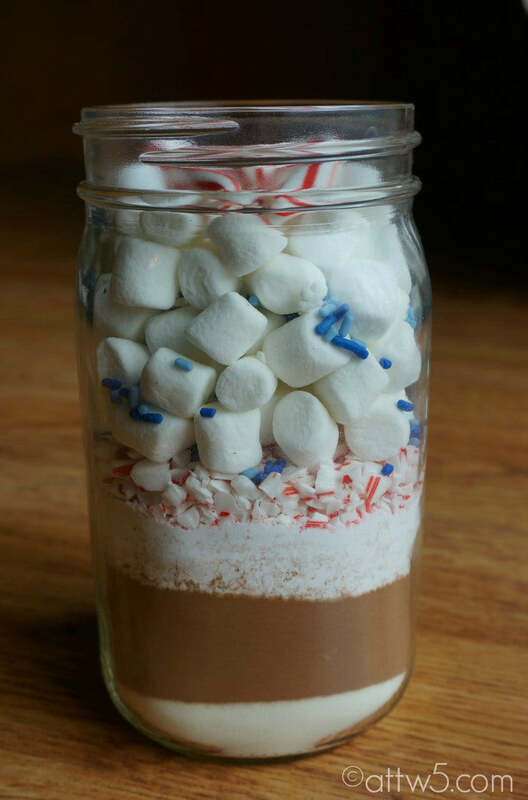 You’ll add powdered milk, cocoa powder, sugar, candy canes, and marshmallows to this jar, and then decorate. To make, just pour the ingredients into a bowl and make cocoa as normal. Or you can use a long-handled spoon to scoop out ingredients in proportion. Get the recipe at And Then There Were 5. 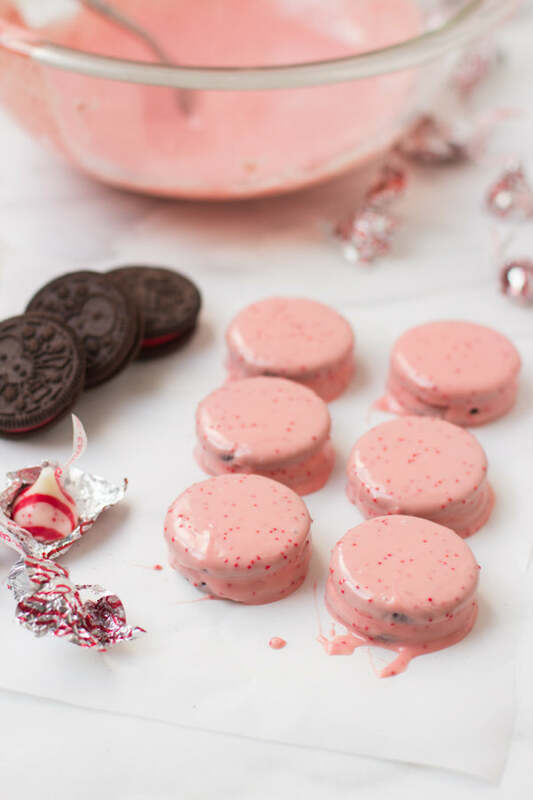 You could make candy cane Oreos by taking off the top, sprinkling with candy canes, and reassembling. If that were the case this recipe woudln’t show up in this space. Instead, Carrian at Oh, Sweet Basil makes a delicious liquid in which you dip your Oreos. This is really as simple as it gets. Find a package of peppermint Hershey Kisses, which are probably heavily discounted right now. Melt them in the microwave (or in a double boiler, which we find works much better). Then dip the Oreos. One and a half bags of Kisses should cover your entire package of Oroes. We dare you not to eat the entire package in a sitting. 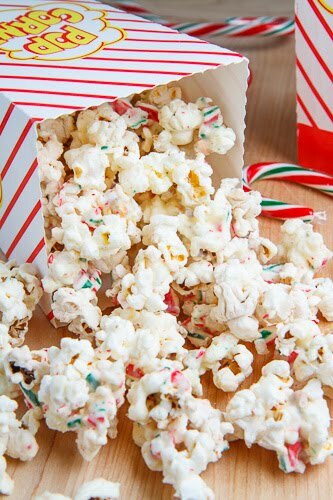 Oh yes, we’re bringing candy canes to popcorn. Or, rather, Kevin at Closet Cooking is. You won’t get hot pop corn out of this — there is melted white chocolate involved, so it has to be cool. As long as you love thos novelty popcorns, you will adore this recipe. This is one we tried, because it was so easy. And yeah, I’ve never seen a bag of popcorn go so fast. The hardest part is waiting for it to cool, which we sped up by putting it in the fridge. We suggest you do the same. Candy canes are red and white. The colors of Valentine’s Day are red and white. Why aren’t candy canes also associated with VDay? With a little ingenuity, and heat, you can turn those extra candy canes into Valentine’s Day treats for friends and family. Cindy from Skip To My Lou uses mini candy canes, and they do seem to work best. But it seems that you could do the same thign with regular candy canes, just not on a lollipop. You’re basically melting the candy canes in a 300-degree oven, so be careful. You don’t want them to melt completely, but they have to be soft enough to combine. 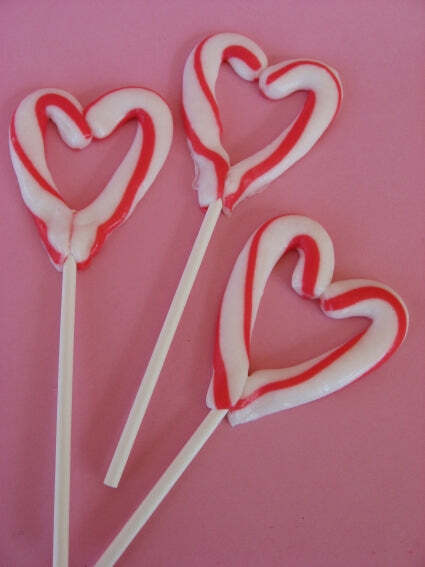 If you do it right, you’ll have some hearts that you can use to make lollipops, or just standalone VDay candies. Get the recipe at Skip To My Lou.